Political concerns have held back shares of Diebold, which makes touch screen voting machines. NEW YORK (CNN/Money) - Considering all the controversy about hanging chads and butterfly ballots four years ago, you would think a company that makes electronic voting machines would have a banner year in 2004. But for Diebold, the largest manufacturer of touch screen voting machines, that hasn't been the case. The company came under fire last year for a letter that Diebold CEO Walden O'Dell wrote as a fundraising pitch to Republicans. In the letter, O'Dell said he was "committed to helping Ohio deliver its electoral votes to the president." Diebold is based in North Canton, Ohio. To quell criticism, Diebold amended its corporate ethics policy in June, barring top executives, including O'Dell, from contributing to political candidates or parties or participating in any political activities except for voting. But that's not the only knock against the company. A lawsuit was filed against Diebold last year in California alleging that software flaws makes the voting machines vulnerable to hacker attacks and computer viruses. There are also concerns about the lack of a verifiable paper trail with electronic voting. Mike Jacobsen, a spokesman for Diebold said that Diebold has never had security lapses with any of its voting machines but that it has nonetheless taken extra steps during the past few months, including adding enhanced encryption technologies, to ensure that there are no problems this November. Jacobsen said that between 8 million and 9 million registered voters in parts of Georgia, Maryland and California would be using its machines this November. He added that the federal government would hopefully issue more guidelines about standards for electronic voting, including the need for a paper trail, in the coming months. Still, the lingering headaches associated with this business have hurt results. Diebold has said that it expects election systems revenue of about $75 to $85 million for the full year, down from $100.2 million a year ago and $111 million in 2002. Diebold also makes automated teller machines (ATMs) and security devices like safes and vaults for the financial services industry, and voting machines account for about 3 percent of its business. ï Elephants, bulls and bears, oh my! ï Bush or Kerry? Who cares? The company has said that the election systems business should have a neutral to slightly dilutive effect on overall profits in the third quarter. Translation: At best, the unit will break even. A year ago, the business helped boost net earnings by 6 cents a share. So to some, this year's problems amount to a wasted opportunity. "This year, Diebold is losing money in the U.S. voting machine business," said Donald Taylor, manager of the Franklin Rising Dividends fund, which owns shares in Diebold. "A lot of issues on the voting side of Diebold's business are dissipating but it's too late to help results for 2004." Some hold out hope, however, that more states will begin to replace older voting machines within the next few years and that this could be a boon for Diebold. "We'll be looking for an uptick in the voting business in 2005 and the next couple of years," said Matt Summerville, an analyst with Keybanc Capital Markets, adding that Diebold is in the running to win orders for voting machines in Illinois, Ohio and Utah. Summerville thinks that it wouldn't be a stretch for the unit to eventually generate more than 10 percent of Diebold's overall revenue. Analysts estimate that Diebold controls about 50 percent of the electronic voting machine market, which could generate between $1 billion and $2 billion in revenues over the next few years. Sequoia Voting Systems, owned by British printing firm De La Rue, and Election Systems & Software (ES&S), a private company based in Omaha, are two of Diebold's top competitors in this business. But what's more frustrating for investors is that the focus on the relatively small election systems business has overshadowed Diebold's strong position in ATMs and security devices. "The election controversy has had a negative impact on Diebold's stock," said Kartik Mehta, an analyst with FTN Midwest Research. "The remaining 97 percent of the business is doing extremely well." 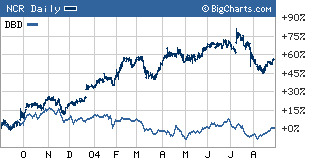 NCR, Diebold's top ATM competitor, has soared in the past year while Diebold has struggled. Diebold is expected to report earnings increases of about 13 percent a year for the next few years, slightly lower than the projected long-term growth rate of 15 percent for its top competitor in the ATM business, NCR. But shares of Diebold (DBD: Research, Estimates) are relatively flat over the past year and trade at just 16 times earnings estimates for 2005 while NCR (NCR: Research, Estimates) has surged nearly 60 percent during the past 12 months and has a P/E of about 23. Mehta thinks that this valuation leaves little downside for the stock, even if there are more problems surrounding e-voting this November. "Risk is pretty much priced out of the stock at this point in time. The market has already discounted any type of election or voting controversy," he said. But Franklin's Taylor wonders whether it's worth the hassle for Diebold to stay in the election terminal business. He thinks that even though the company has now barred executives from engaging in political activities, that won't completely silence the company's critics. "If you get into next year and Diebold's ownership is still a problem, the company should be able to sell it. I don't think they are absolutely wedded to the voting machine business," said Taylor. Jacobsen said, however, that Diebold is committed to the election systems business, pointing out that there is also strong potential for growth internationally. Diebold has a subsidiary in Brazil that makes voting machines used in that country. Analysts quoted in this story do not own shares of Diebold and their firms have no investment banking relationships with the company.